Take a apn and heat it for 2 sec. Add 4 spoons of ghee in it and heat it for 2 sec. Add cashew nuts, raisins, badam and pista pieces in it. Fry for 2 to 3 sec untill nuts comes to golden brown colour. After nuts comes to golden colour, remove fried nuts from the pan. Take fried nuts into a cup and keep aside. Now add remainging ghee in the pan and heat it for 2 sec. Now add besan flour in it and fry for 2 to 3 min by mixing it well. Add grated coconut, milk also now and mix well. Add sugar in it and mix well for 5 min continously. After 5 min, cook it untill the mixture comes to very closer. Now add elachi powder and fried nuts into it. Make the stove off and mix well. Take this mixture into a plate and keep aside. Cool it for 5 to 8 min and make this into small balls. You can wet your hands while doing laddus if needed. Make all the mixture into laddus and eat/ serve. Now you are ready with navarathan laddus infront of you. Eat and enjoy the very tasty, delicious and yummy sweet item Navaratan Laddu . Take a jar and add rice flakes in it. Grind it to make it as a powder. Now add coconut pieces and sugar also in it. Grind it again to make all as a fine powder. Take a bowl and add this powder in it. Take a pan and make the stove on. Put pan on the stove and heat it for 2 sec. Add ghee in it and heat it for 2 sec. Add kaju and raisins in it and fry well. Fry it untill kaju and raisins comes to light golden colour. After make the stove off and add this fried nuts and raisins in it. Add the melted ghee also in it and mix well. Make this mixture into small balls like laddu's. You can wet your hands while making laddu also. Now you are ready with rice flakes laddu infront of you. Eat and enjoy the very tasty, delicious and yummy sweet item rice flakes laddu. Take bread slices into a plate and cut the edges of it. Now make bread slices into pieces and take into a plate. Take a jar and add this into it. Make it as a fine powder and take into a bowl. Add sugar powder and elachi powder aslo in it. Add cashew nuts and raisins in it. Fry it untill nuts and raisins comes to light golden colour. After colour has changed, make the stove off and add this to the bowl. Now mix well and make this miture into small balls and keep aside. Now you are ready with bread laddu infront of you. Eat and enjoy the very tasty, delicious and yummy sweet item bread laddu. Take a bowl and add dates pieces. Add almond pieces, cashew nut pieces also. Add dry fruit pieces and raisins in it. Mix thoroughly to make as small balls using hand. Now you are ready with dry fruits laddu. 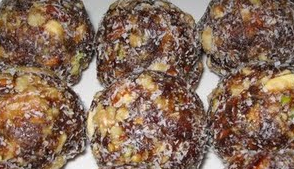 Eat and enjoy the very tasty and healthy sweet dry fruits laddu.